A team of researchers from China and the U.S. has identified a new ancient mammal ancestor recently found in a part of China. In their paper published in the journal Nature, the group describes the creature, which they have named Ambolestes zhoui, and where it fits in the ancestral tree. 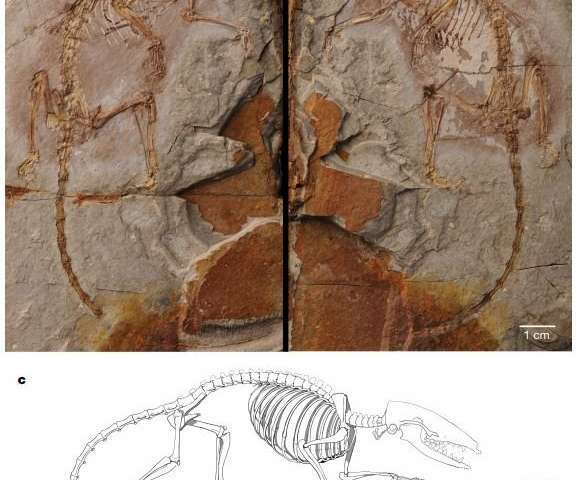 The well-preserved (and nearly complete) skeleton was unearthed in Yixian County in a northern part of the Inner Mongolia Autonomous Region—it has since been dated to approximately 126 million years ago, and has been identified as eutherian (a group that includes placentals but not marsupials and monotremes). The team reports that it had two physical features that are not found in modern mammals: an ectotympanic and hyoid apparatus. The first is a bony ring used to hold the eardrum in place. The second is a U-shaped bone that supports the tongue. The researchers note that the remains are part of a large collection of ancient vertebrates uncovered in the area over the past 20 years—approximately 120 species from the area have thus far been identified. Most of those, they note, have been dated to the Early Cretaceous Jehol. Therian mammals, they add, are rare finds in the area. Testing of the remains has included use of both CT scans and 3-D technology as a means of identification and reconstruction of original features. The results are remarkably detailed images of bones and teeth with accompanying labeling and explanatory details. The researchers report also that the mammal remains were those of a creature of placental lineage, but which had features consistent with marsupials. These findings indicate that Asia may not be the place of origin for marsupials. They note also that prior research has suggested that the placental and marsupial mammal divergence likely occurred during the Jurassic period. The point out that the oldest known metatherians were those found in North America and dated to approximately 110 million years ago. The researchers also used their paper to announce the establishment of a new database that will hold lineage information surrounding early mammals. Molecular estimates of the divergence of placental and marsupial mammals and their broader clades (Eutheria and Metatheria, respectively) fall primarily in the Jurassic period. Supporting these estimates, Juramaia—the oldest purported eutherian—is from the early Late Jurassic (160 million years ago) of northeastern China. Sinodelphys—the oldest purported metatherian—is from the same geographic area but is 35 million years younger, from the Jehol biota. Here we report a new Jehol eutherian, Ambolestes zhoui, with a nearly complete skeleton that preserves anatomical details that are unknown from contemporaneous mammals, including the ectotympanic and hyoid apparatus. This new fossil demonstrates that Sinodelphys is a eutherian, and that postcranial differences between Sinodelphys and the Jehol eutherian Eomaia—previously thought to indicate separate invasions of a scansorial niche by eutherians and metatherians—are instead variations among the early members of the placental lineage. The oldest known metatherians are now not from eastern Asia but are 110 million years old from western North America, which produces a 50-million-year ghost lineage for Metatheria. Looks like a darn rat! So far rats and roaches seem to survive pretty much anything.